A harmonious home can lead to improved energy flow and a more peaceful domestic life. When you incorporate feng shui, purposeful design and careful arrangement can help you reach these goals. 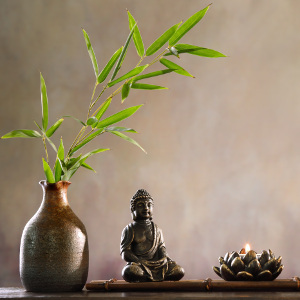 Here are six ways to create harmony in your home with feng shui elements. There are two bagua, or energy maps associated with feng shui. Use either the classical bagua or Western energy map, and seek out a psychic medium for a better sense of your personal energy. If you use the classical bagua, you’ll need a compass to determine the primary direction and layout of your home. With the Western energy map, you’ll need to define nine zones of your home and link them with elements like love, wealth, career, and family. A sense of harmony and feeling of positivity starts at the entrance to your home, so pay special attention to the front door. Be sure that any path leading to your front door is a curved line to keep out the negative energy. Keep your entranceway free from clutter, ensure that nothing blocks the front door, and invite good energy to enter. Open floorplans work well with feng shui principles, since they encourage a constant flow of energy. No matter how your space is laid out, though, you can create positive flow. Be sure that all the natural elements, including water, fire, earth, metal, and wood are balanced throughout your home. Use ceramic pieces to represent the earth, candles to stand for fire, glass to signify water, natural furniture to capture wood, and bronze elements for metal. Determine your lucky direction for better energy flow and the most appropriate seating arrangements in your home. Feng shui encourages painting your home with light colors to encourage tranquility, but it’s also important to incorporate color appropriately. The colors of feng shui reflect the five elements, so you’ll need to incorporate fiery red, earthy browns, metallic whites, watery blues, and natural greens. Combining these colors appropriately can be complicated, so don’t hesitate to get a second opinion from an online psychic. One of the most important principles in feng shui is bringing greenery indoors. Whether you prefer small plants on your desk, a row of succulents along your kitchen window, or showy plants in your family room, live plants will help energy flow smoothly inside your home. You don’t have to stop with greenery, though. Wood, fountains, and flowers also contribute to the natural harmony in your home. All too often, bedrooms become the places where you hide messes and forego proper storage. To ensure harmony throughout your home, keep all of the bedrooms as clean and orderly as possible. Do this by tidying regularly, as well as finding suitable places for all belongings. Extend this concept throughout the rest of your home, and promote good energy with a lack of clutter in each room. It’s easy to create a balanced, harmonious home by following the basic principles of feng shui. Keep your design natural, balanced, and complementary, and you can look forward to a happy home.